Corned beef and cabbage is an Irish-American dish that has long been a favorite for St. Patrick's Day. While, historically, the Irish produced corned beef, they were more likely to eat more affordable bacon or salt pork. Irish-American immigrants, more prosperous in this country, began eating beef. In Ireland, the traditional St. Patrick's Day meal is likely to be bacon or lamb. 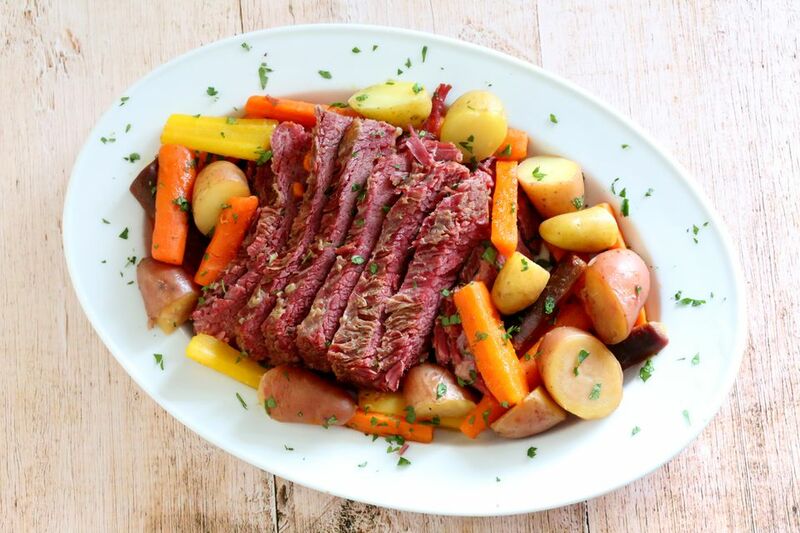 Don't wait for St. Patrick's Day to enjoy a comforting, delicious boiled dinner. Corned beef is a fabulous Sunday dinner choice as well. Add potatoes and carrots to the pot, and you'll have an easy and delicious one-pot meal. You might cook it for the leftovers alone! This list of recipes includes corned beef and cabbage dinners and leftovers using corned beef and cabbage. A fresh brisket, several spices, and an easy brine make a delicious homemade corned beef and cabbage meal, and it has no artificial preservatives! Plan to start the preparation about 7 days in advance, so the beef has plenty of time to cure. This corned beef is a great starting point for a memorable St. Patrick's Day meal. This classic corned beef and cabbage meal starts with a variety of herbs and spices, beef broth, and corned beef brisket. The corned beef simmers on the stovetop with potatoes, carrots, and cabbage. The simmered corned beef is finished in the oven with a delicious, tangy brown sugar and mustard glaze. Use turnips or rutabagas along with potatoes and carrots for this glazed corned beef and cabbage dinner. This Instant Pot corned beef and cabbage dinner is made in record time, so you don't have to wait for a holiday or weekend to make that meal. If you want a neat, sliceable corned beef, choose a flat cut. If you want a shreddable corned beef, choose a pointcut roast. If you don't have leftovers, use deli corned beef in this flavorful soup. This corned beef and cabbage soup with barley is simmered to perfection on the stovetop. Serve this fantastic oven-braised corned beef with beer, boiled cabbage and vegetables. Use your favorite brand of beer or make it with a bottle of Irish stout. This easy crock pot corned beef and cabbage chowder is a delicious way to enjoy corned beef and cabbage leftovers, and it's so quick to put together. The dish uses leftover corned beef and vegetables from a big corned beef and cabbage dinner. Cream of potato soup is used to make a fabulous soup. It just doesn't get any easier! Here's an easy and convenient way to cook a boiled dinner. All you have to do is throw everything together in the crock pot and press a button. Come home to a fabulous slow cooker corned beef and cabbage dinner! These creative corned beef and cabbage rolls are a delicious, inventive way to use leftover corned beef. The diced corned beef and potatoes are stuffed into cabbage leaves and cooked to perfection on the stovetop. Serve the cabbage rolls with the cheese sauce or serve them with a seasoned white sauce. This simple oven corned beef and vegetables simmers to perfection in the oven and features cabbage wedges, potatoes, carrots, and onions. This quick corned beef and cabbage dinner is faster than a traditional boiled dinner because the corned beef is pre-cooked. Buy thick-sliced corned beef from the deli and add it to the conventional vegetables. This amazing corned beef hash with cabbage and carrots utilizes all of the leftover meat and vegetables from your corned beef and cabbage dinner. It's a flavorful and colorful has; serve it as a lunch or dinner entree or serve it along with breakfast. This version is a classic St. Patrick's Day dinner featuring corned beef and cabbage. A sour cream and horseradish sauce elevates this classic crock pot corned beef dinner. This delicious quick and easy corned beef and cabbage casserole comes together with only 5 ingredients. The combination makes a tasty one-dish meal and an excellent way to celebrate St. Paddy's Day. 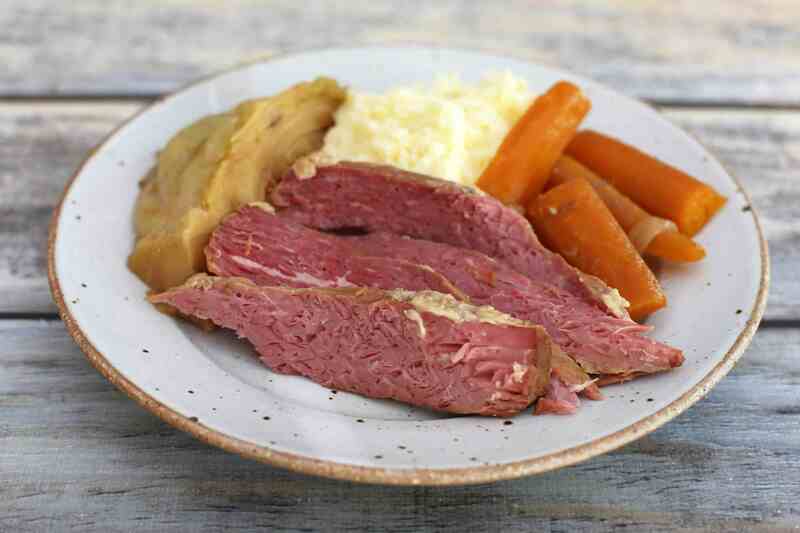 This perfect corned beef and cabbage meal features an optional horseradish and mustard sauce. The corned beef is simmered with potatoes, onions, cabbage, carrots, and rutabaga. Allspice berries and herbs make this an extra-special boiled dinner.